It’s hard for me to imagine being in a firefight at all, let alone having to make tactical decisions and communicate with other soldiers over the roar of tanks, guns, jets, and explosions. But our troops do it every day — after they’ve gotten used to it, at least. It can be a bit disorientating at first, as you can imagine, and this project by a Missouri professor is intended to get them inured to the cacophany before they’re actually on the battlefield. 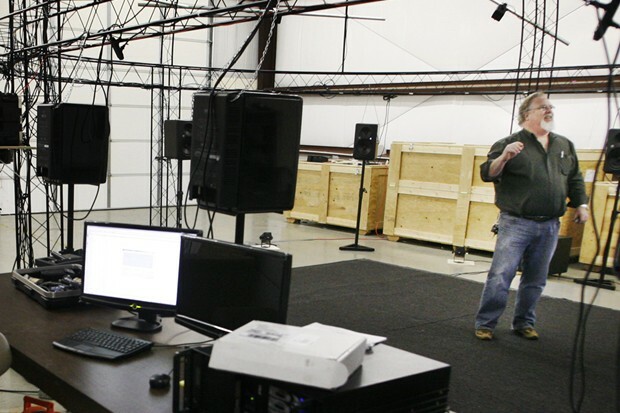 Steven Grant works in “Communications and Digital Signal Processing,” and has created a sort of jumbo-sized surround-sound system in order to blast sound at GIs at levels approaching those found in battle. There are 64 speakers for precise locational audio, including four subwoofers for that low end. Recordings of rifle fire, helicopters, and other common noises are played back at up to 100dB — any higher would violate OSHA guidelines. Wired’s Danger Room has a quick interview with Grant. I know there are simulation systems like this out there, but I’m sure this kind of development is always welcome.